Order Ritchies Cider Yeast 5g from the Stirling Homebrew Shop UK. 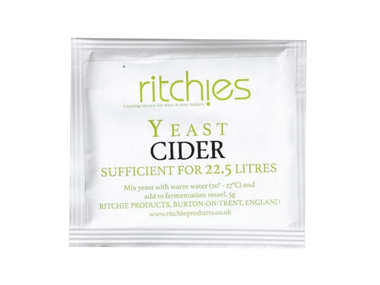 Buy Ritchies Cider Yeast - 5g sachet and other Homebrew Chemicals safely online in the UK. This cider yeast is sufficient for up to 23 litres (5 gallon) of homemade cider. Especially selected for its ability to produce exceptional crisp and refreshing ciders. Cider yeast for making your own cider at home! Where to buy Ritchies Cider Yeast 5g safely online? Shop at the Stirling Homebrew Shop if you are wondering where you can buy Ritchies Cider Yeast - 5g sachet safely online in the United Kingdom. Cider Yeast 5g - Ritchies Cider Yeast - 5g sachet in Homebrew Chemicals and Homebrew.